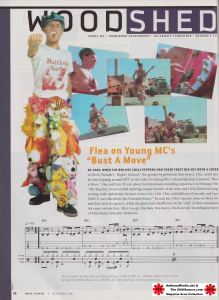 In 1989, when the Red Hot Chili Peppers had their first big hit with a cover of Stevie Wonder’s “Higher Ground,” the group’s hyperkinetic bass player, Flea, could also be seen hopping around MTV in the video for Young MC’s colossal hip-hop crossover, “Bust A Move.” Flea told BASS PLAYER about his bittersweet recording experience in February’96: “The bass line I wrote ended up being a major melody of the tune, and I felt I deserved song-writing credit and money because it was a No. 1 hit. They sold millions of records, and I got $200! It was ridiculous, but I learned from it.” In each bar, Flea’s staccato notes on beats one and three lock in a groove, while the ghost-note shuffle feel on the “and” of three anticipates the snare on beat four. 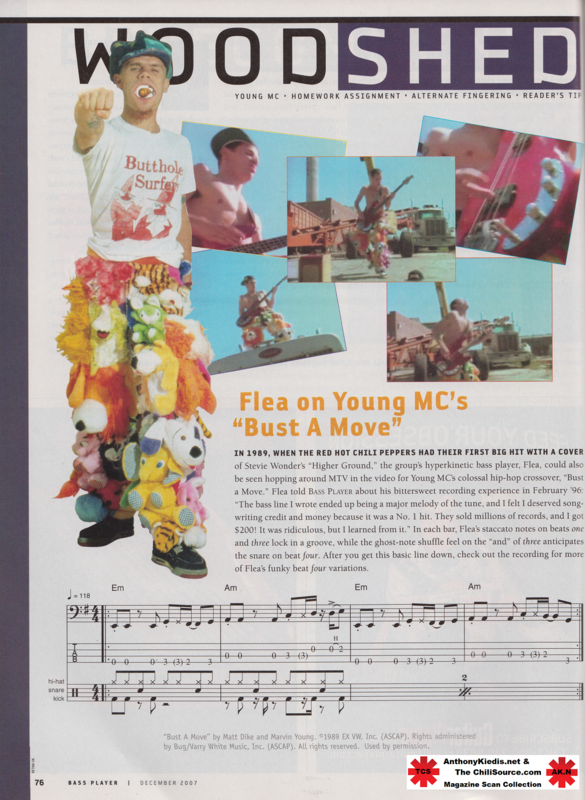 After you get this basic line down, check out the recording for more of Flea’s funky beat four variations.